Dragonfire Crusader Single Coil Strat pickups feature oversized adjustable hex-style cap poles and dual ceramic bar magnets for a wide effect magnetic field giving you rock-steady tone and performance. This styling provides more complete coverage to help make sure every nuanced note can play through. Players typically choose Crusaders for Rock & Metal, though they are also great for Thrash & Punk as well as other genres. These are dedicated position pickups for performance enhancement and differentiation. 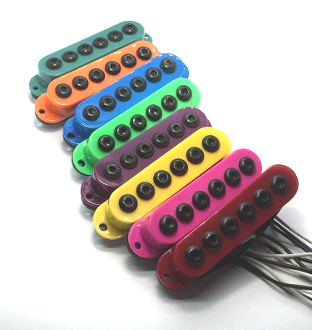 Each pickup is wound specifically for a particular position, so these pickups are not position interchangeable. The Middle position pickup is Reverse-Wound and Reverse-Polarity (RWRP) to ensure the best possible set execution and collaboration. RWRP gives you hum-cancelling in Positions 2 & 4. These are 2-wire pickups that come with a colored hot (each position has a different color of hot wire) and a black ground wire for easy installation. 250K pots and 0.022 or 0.047 tone caps (available separately) are recommended for use with these pickups.